Sri Lanka's military says it is trying to secure the north-east coastline to encircle Tamil Tiger rebels as part of a final assault. Troops are moving north from the captured rebel town of Mullaitivu to take the 30km (18 mile) stretch. The military says it hopes to control the entire north within weeks. Meanwhile the UN secretary general and the European Union have expressed deep concern for civilians who are caught in the fighting. 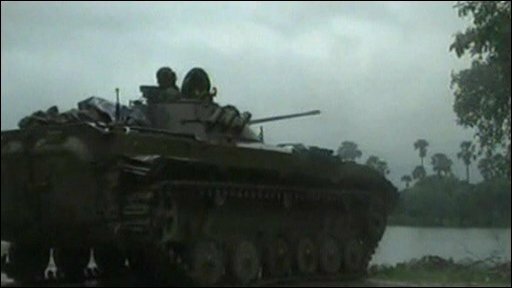 The BBC's Ethirajan Anbarasan in Colombo says the army's latest reports speak of another base captured in the Mullaitivu region and 25 rebels killed in separate operations. The military says there are intense exchanges of mortar fire and close-quarter clashes. Independent journalists are not allowed in the conflict zone so information from both sides cannot be verified. 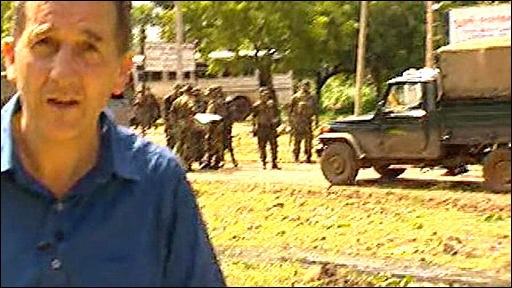 However, a group of journalists, including the BBC's Chris Morris, was taken to the region on Tuesday. Brig Nandana Udawatte told them: "We are moving along the coast as well as to the north-west towards another pocket of Tiger resistance." Brig Udawatte, who led the capture of Mullaitivu, added: "Mortar fire, indirect fire, close-quarter battles are going on 1.5 km from Puthukkudiyiruppu." Pro-rebel sources have not commented on the latest fighting but have accused the army of killing hundreds of civilians with shell fire, allegations the military denies. Chris Morris says that apart from soldiers on every corner in Mullaitivu, it is a ghost town. Most of the buildings, houses and shops are damaged or destroyed. He says its capture is a big victory for the army but that the Tigers also appear on the surface undaunted, with the sound of artillery fire not that far away echoing down the empty streets. Pressure is building on both sides to protect about 250,000 civilians estimated still to be in the region. UN Secretary General Ban Ki-moon expressed deep concern over the fate of the civilians. The UN says that dozens are dead or injured and the situation is desperate. Mr Ban said in a statement he was "deeply concerned about the safety and well-being of civilians caught in intensified fighting in the Vanni region of Sri Lanka". He urged both sides "to accord immediate and absolute priority to ensuring the protection and well-being of civilians, including humanitarian aid workers". The UN secretary general also said that both sides should respect "no fire zones", "safe areas", and civilian infrastructure including schools, medical facilities and humanitarian facilities. The International Red Cross (ICRC) said on Tuesday that hundreds of civilians have been killed by the fighting in the north and about 250,000 people are trapped inside the rebel-held area. It says a major humanitarian crisis is unfolding. The government argues that it is doing everything it can to minimise the level of civilian casualties. India's Foreign Minister Pranab Mukherjee, who is visited Colombo on Tuesday, said before leaving Delhi he was concerned about the plight of civilians and would discuss how they could be protected. The European Union asked Sri Lankan Foreign Minister Rohitha Bogollagama to ensure that civilians were protected in the crossfire. EU External Relations Commissioner Benita Ferrero-Waldner said the rebels - who are on the EU list of terrorist groups - must "guarantee the free movement of the civilian population and release all child soldiers". A government health official in the Kilinochchi region has said more than 170 civilians have died in the Kilinochchi and Mullaitivu areas this year and more than 720 have been admitted to hospital. The army has denied any connection with civilian deaths. Separately, the rebels' political leader, B Nadesan, told the BBC that their top leader had not left Sri Lanka and was still leading the "freedom struggle". He said reports that Velupillai Prabhakaran had fled were "malicious propaganda". He promised the rebels would fight on. Mr Nadesan shrugged off recent military setbacks and said the Tigers would not lay down their arms until the freedom and dignity of their people were guaranteed. The military says it is now advancing into a 300 sq km (115 sq mile) area of land in which the Tamil Tigers are still operating. Mr Nadesan says the rebels hold twice that area. The government has vowed to crush the rebels, who have been fighting for a separate homeland for Tamils for 25 years. At least 70,000 people have been killed during the insurgency.